We’re gearing up for a big storm here at the farm and I’m thankful now that we’ve spent so many tireless hours harvesting bulk items from the field to have on hand during these storms. It makes preparing a farm fresh meal pretty easy even when the ground is covered in snow. I hope you all enjoy this recipe as much as we do. For my vegetarian friends out there–try this same method but spread the butter over roasted cauliflower steaks or roasted potatoes. Let me know what you all think! Cheers from a stormy Tumbleweed Farm. Preheat the oven to 425F. In a large bowl combine the butter, miso, honey and vinegar. Mix until smooth and well incorporated. Add the chicken to the bowl and rub it all over with the mixture--even rubbing the mixture underneath the skin of the chicken. Place the chicken in a single layer in a roasting pan and bake in the oven until fully cooked and the skin is dark brown and lightly crips, about 30-35 minutes. Flip the chicken once or twice while cooking. An internal temperature of 160-165F is what you're looking for. While the chicken bakes bring a large pot of lightly salted water to a boil. Add the cauliflower florets and cook until tender, about 8 minutes. Remove from the water and drain. Add the cauliflower to a large bowl with 1 tablespoon butter and the heavy cream. Mash until smooth and creamy. Season to taste with salt and pepper. In a skillet over medium heat add the remaining 1 tablespoon of butter. Once melted and the sliced collard greens and a healthy pinch of salt and pepper. Cook, stirring often, until the collards are bright green, and tender. About 5 minutes. Remove from the heat and set aside. 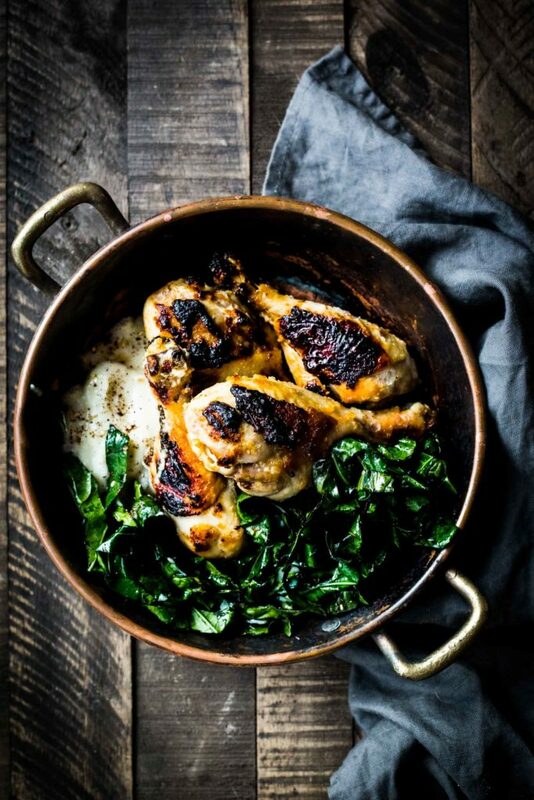 Divide the mashed cauliflower, collards and chicken between plates and serve warm or at room temperature. Beautiful photo and the chicken looks so yummy! This sounds wonderful. I am planning to try this during the week. Thanks for sharing it with us. I love your recipes. Looks great! Any recommendations for making this without the cream? For the cream in the mashed cauliflower you can substitute with almond milk (or another dairy free milk) if you can’t have dairy you can try using Ghee or clarified butter instead of traditional unsalted butter in the miso/butter mixture. (ghee doesn’t contain lactose).Let me know if you try this! I live in the south, so of course I added bacon to your wonderful recipe. After cooking the bacon a bit, I added the collards in with the bacon & bacon grease. After the greens wilted a bit, I added the leftover miso chicken drippings to the collards and reduced it to get this wonderful glaze and crisp to the collards. Overall, fantastic recipe and the smell coming from the chicken in the oven is to die for! Paired it with a good Cabernet Sauvignon. Thanks so much. Cheers, M.
Love your additions! Happy you enjoyed this recipe! Made this last night for my husband and myself. Both of us commented that not only was it delicious but a simple wonderful company dinner. Will be making it again sooner than I normally repeat a meal. This is an amazing and delicious dish! My hubs and I both LOVED it. Thanks! Should chicken be marinated right before cooking or could I possibly marinate the night before and just pop it in the oven when I am ready to cook it? thank you for the wonderful recipes!